Where Are You Bound? : Volume 1 Edition 2 Contains World Maps of Languages Spoken in Book. Full page illustrations make this a great story time book. Artwork by Sylvia LeDoux makes it a collectors item. The poem is delightful and each spread is translated in Spanish, German, French, Portuguese and Italian. Kids love this exposure to the world and the globes at the end of the story show where these languages are spoken. In the story a child starts to pick a daisy when a bee buzzes by and saves her life. The child ask the daisy "Where Are You Bound?" The imagination of the child takes the flower around the world. It is entertaining and has many life lessons. 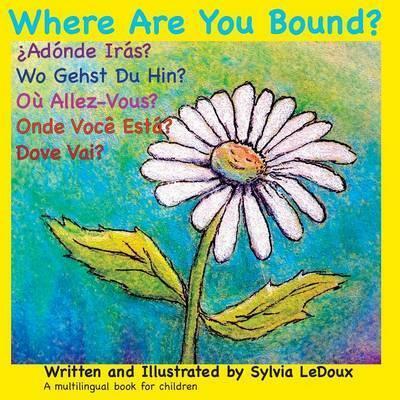 You can use this book to help children with the use of different languages when living in a bilingual situation. Each page contains English, Spanish, German, French, Italian and Portuguese translations of the poem. The captivating images help build language and vocabulary skills. It creates bridges in communication skills especially for small children when their skills are being created. The story and images are universal and bring a good feeling with a happy ending. This book is a treasure for all children worldwide! Edition Statement 2nd Contains World Maps of Languag ed.